One of the fastest collegiate electric motorcycle teams on the planet, Buckeye Current, uses Stratasys 3D printing technology in their Ohio State University (OSU) base to produce one-off motorcycle components. A huge part of the teams success is down to the ability to design these parts to exacting specifications, quickly and cost-effectively with the use of Fused Deposition Modelling technology (FDM). The teams directive was to design and build a customised motorcycle to race at the second-oldest motorsport event in North America; Pikes Peak International Hill Climb. The final result was the RW-3x motorcycle, which combines complex, custom-designed, one-off components to house a number of the most important components on the motorcycle in order to prepare the bike for the arduous race ahead. For example, Stratasys FDM 3D printing technology was used to produce a large part of the RW-3xs main electronic attachment under its battery pack, located on the bottom of the bike. This component is the largest 3D printed piece that the Buckeye Current has used so far at 18 x 12 x 6 inches, which was only made possible by the teams use of the Stratasys Fortus 900mc Production series 3D printer with its impressive 36 x 24 x 36 inch build envelope. Printed in the resolution and tight precision needed for such a critical component, it acts as a shield for the teams data logging system as well as protecting its high-voltage electronics from debris and water during the strenuous 12.4 mile Pikes Peak course. The teams designs were all produced using 3D printed PC-ABS, PC and ASA materials on a Fortus 400mc alongside a Fortus 900mc. While 3D printing is an ideal solution for cutting costs and producing multi-faceted designs with complex geometries, the team had to ensure that these complex parts were perfected through a multitude of design iterations, whilst also keeping to budget limitations. 3D printing technology is an effective replacement for conventional methods of prototyping, such as CNC machining or injection moulding, because not only is it a cost-efficient, time-saving solution but designs can also be created with a variety of different functions in mind. These functions might include: improving aesthetics such as complex surfaces and logos, to focusing on maximising performance through waterproofing, weight reduction and aerodynamics. 3D printing is an especially economical solution for the creation of one-off parts, conventional methods would prove a costly approach and could result in longer lead times, as well as running the risk of missing the target engineering goals laid out by the team. 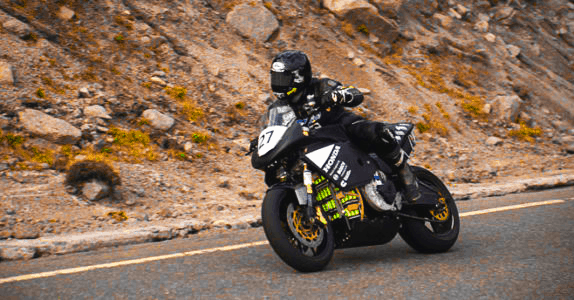 Earning third place in the electric class with their RW-3x motorcycle, Buckeye Current found themselves speeding towards the winners circle in the Pikes Peak competition. The teams decision to incorporate 3D printing into their motorcycle design was a success for the Ohio State University students, gaining invaluable knowledge through this competition which may yet help to make the next generation of automotive engineering professionals. Want a challenge? Enter the Stratasys Extreme Redesign Competition, find full details here (https://www.sys-uk.com/news/stratasys-3d-printing-extreme-redesign-competition/) and see what you could win.